> Limeade > What Makes a Wellness Program Effective? The Answers From Employees Will Surprise You. Do you know if your employees are satisfied with their benefits? The question is more important than you may think. A survey of nearly 2,000 employees uncovered exactly what motivates them to be their best. For starters, employee engagement is higher at companies where people are satisfied with the health and well-being benefits their employers provide. The national study by Limeade, an employee engagement platform, and Quantum Workplace, a leader in workplace survey and employee-feedback technology, uncovers employee perceptions of 31 benefits in six areas of total health and well-being: financial health, emotional health and stress management, nutrition, physical fitness, physical health, and work-life balance. Nearly 12 percent of employees don’t have a clear understanding of the benefits their companies offer. These employees were 20 percent less likely to be engaged than employees who did have a clear understanding of their benefits. 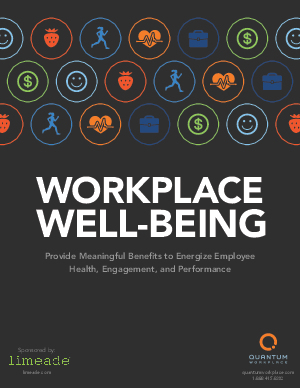 More than 75 percent of engaged employees are satisfied with their company’s health and well-being benefits; fewer than half of “hostile” employees are satisfied with the same benefits. Nearly 71 percent of employees want standard-of-living raises, but only 31 percent of employers provide them. After 401(k) matching, a health savings account is the most-provided financial benefit (desired by 63 percent of employees), but only 21 percent of employers prefer it as a benefit. Nearly 77 percent of employees want time off to recharge, but fewer than half of employers provide it as an emotional health and stress management benefit. Nearly 74 percent of employees want healthy cafeteria or vending machine options at work, but fewer than half of employers provide these as health or nutrition benefits. More than 20 percent of millennials (age 35 and younger) preferred company-wide exercise challenges. Preference steadily declined with age, dropping drastically among employees 56 and older. One-third of employees 25 years old and younger said they wanted corporate-funded community events, a number that also declined with age.